1. I'm trying to create a night time "phone calls only" profile, where the phone rings (3/7) but notifications stay off (0/7). Ridiculously, this is not possible in ICS and above. Can I circumvent this with an event, queued event, or in any other way? 2. Can I create an event to automatically play videos in landscape mode? 1. First uncheck box for "Link ringer & notifications volumes" in sounds settings. 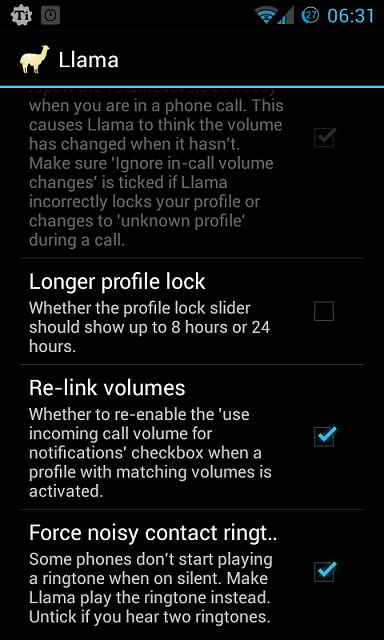 In Llama, profiles tab, edit the desired profile (night for instance), set the volumes for ringtone volume (3/7) and notification volume (0/7). I'm posting screenshots of what I have, in Llama profile settings that's also where you add noisy contacts, just in case. Noting that I didn't have to separate the ringtone and notification volumes to obtain that Llama setting. any way it can be ported via a MOD perhaps>? Yeah, it's definitely CM. I tried the re-link volume options, but it doesn't do what I'm looking for. I thought about Noisy Contacts too, but that's just contacts whereas I want any incoming call to ring. 1. Create an event with Call State condition, when Ringing, set a Time Between condition too and set a desired volume as the event's action. Doing so, your Quiet Profile shouldn't be locked. 2. (Not sure this will work) Create an event with App Notification Bar Icon condition, choose Phone, set a Time Between condition too and set a desired volume as the event's action. No locked Quiet profile either!! set a desired volume as the event's action. Doing so, your Quiet Profile shouldn't be locked. I don't understand this part. How do I set a volume as an action? I don't see an option for ringer/notification volume in actions. For both events, you have to create an end event. For event 1 Call State condition, When Not In Call, set Ringer/Notification Volume to 0. Two questions about this: 1. Would the end event be a queued event, or a separate event, and 2. Same question about ringer/notification volume. How do I set it as an action? Sorry I wrote it without checking in Llama! What you have to do here is create a profile with your desired volumes and set an event action that triggers the profile. You have to have two different events, a start event and an end event. Let's say you create a profile called Night Ring, in it you set volume to 3/7. You create an event with time between 11 pm to 6 am, when ringing change profile to Night Ring. 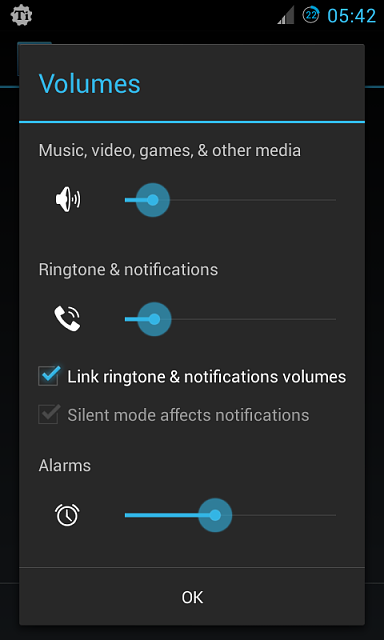 Let's say you already have a profile called Silent At Night, in it you set volume to 0/7. The event associated with it should be time between 11 pm to 6 am, when not in call change profile to Silent At Night. "Can someone describe in detail about the usage of delay, cancel delay if false and repeat functions that are available there in simple English?" Delay- This is referring to the delay before a certain action is triggered. For example even though a condition such me entering my home area is present I can add a delay before a certain action such as connecting to the wifi takes place. Cancel Delay if False- So, lets just use my previous example again. Let's assume that I entered my home area thus potentially triggering me connecting to my wifi. But let's suppose that I had a delay of 10 minutes and I actually left my home area before those 10 minutes were up. In that case my previous condition or trigger would now be false. It really wouldn't make sense for my wifi to turn on if I'm not even home. Repeat Functions- Let's say I had an automation such as turning data on for a couple of minutes so I could receive my updates and then turning them off. Repeat function would be useful in this case. It just repeats whatever it was that you were doing. May not be relevant for some things but yeah thats the gist of it. Thanks for the reply crhistian. Now in my case, my home is in different cell zone than the Metro station is. I have created a rule in wife's android that when she leaves home, wait for 10, cancelled delay if false, and then change gtalk status to "Way to office". It never triggers actually. Where is my mistake? 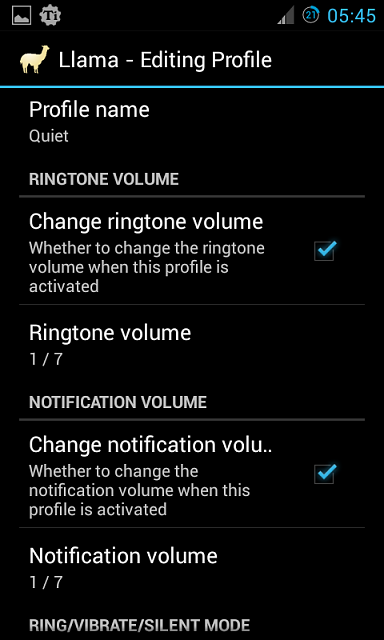 Make sure in your Phone Calls Only profile, you have Change ringtone volume checked and set the volume to 3/7, also the Change ring/vibrate/silent mode should be checked and set on Ring. Now that's where I used to be fooled, the Ringtone! Change ringtone has to be checked for this to work in order for the profile to change the ringtone from none or 0, to an actual ringtone. Select a ringtone and you should be good (also make sure your other profiles have a different ringtone unless it's your default ringtone, but you have to choose a ringtone for every profile even if it's the same ringtone). If that didn't work either, try with App Notification Bar Icon condition, choose Phone, set a Time Between condition and set profile Phone Calls Only as the event's action. not sure what could be wrong, perhaps gtalk is not an app that can be controlled? I have a similar event that triggers a locale plugin when i leave the office that sends a text to my wife to say I am on the way. I tried this. Didn't work. Tried this too, and it didn't work. The issue here is that I can't create a "Phone Calls Only" profile (where ringer is on, but notifications are off.) The closest logical workaround would be the two overlapping events we tried, but even that doesn't work. I'm pretty convinced due to the stupid limitation in ICS, it's not possible to do this. The ideal way of doing Phone Calls Only on a GS3 (if you have a fixed time everyday when you want this activated) would be through Blocking Mode, but, for some reason, WhatsApp notifications don't get blocked in Blocking Mode. Wow I'm surprised even the silent notification doesn't work on your GS3!! Is it possible to make Google voice not ask if I want to dial using it only for particular numbers? Not sure if llama can handle something like this. Sent from my Nexus 4 on the Solavei network. How can I backup my areas, profiles and events? I use Titanium Backup but I'd like to do a separate backup for Llama. I synchronize Llama forder to Dropbox with Dropsync app. Yes, I could do that. Where is the Llama folder? I can't seem to find it. When in silent profile and I specify a noisy contact is that just for the phone ringer? How about a sound when an SMS message comes through from a specified noisy contact? I created an event to change two phone settings and then launch three apps. It seems the apps launch too fast, or possibly one or two get skipped, because when I try to switch out of the active one to one of the others (by holding the Home key), they do not appear in the recently opened list. Is there a way to add a small delay between the opening of each app so that I can switch between them all? Thanks for your help, team! I created event to change two phone settings and then launch three apps. It seems the apps launch too fast, or possibly one or two get skipped, because when I try to switch out of the active one to one of the others (by holding the Home key), they do not appear in the recently opened list. Is there a way to add a small delay between the opening of each app so that I can switch between them all? Thanks for your help, team! I would suggest you to create 3 queued events then for each queued event you make it launch your desired app but with different time delays. I'm using the app for a couple of weeks now and loving it. One thing that i think isn't working for me is wifi pooling. I created an area called near home like someone suggested here that enables wifi pooling to every 5 minutes. When i connect to the home wifi i set wifi pooling to never, disable screen lock and enable wifi so it stays connected. I can see it changes wifi polling to 5 minutes and never but on the Recent tab i see the available wifi networks every minute, like it is still pulling for wifi networks. Shouldn't that stop once i set wifi pooling to never?